Oh my friends, I made the best gussied up macaroni and cheese from Cowgirl Creamery. With those just-burnt tips of the pasta and creamy cheese, this mac and cheese puts Kraft, Velveeta, and Amy’s to shame. Shame, I say. 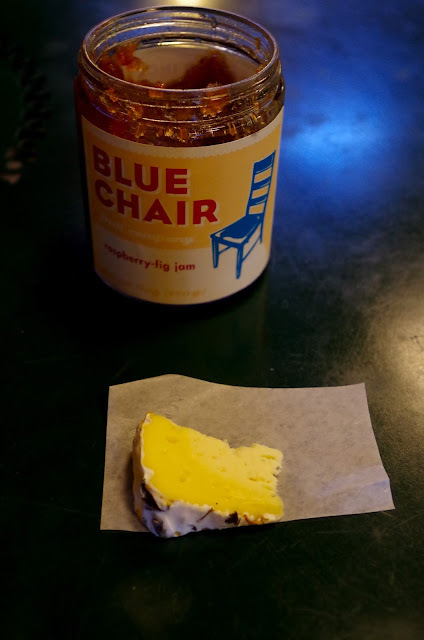 Plus, we went up to Cowgirl Creamery in Point Reyes Station for a tour and a cheese tasting, which would most certainly humiliate Velveeta or any other industrialized cheese. 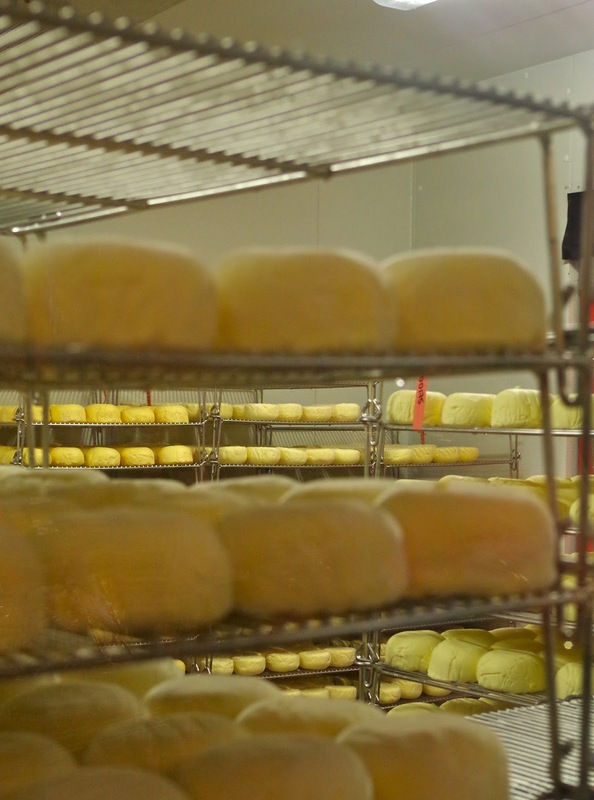 Committed to keeping cheese both artisanal and farmstead, Sue Conley and Peggy Smith (founders of Cowgirl Creamery) have produced a delightful cookbook to accompany their creamery and their shop in Point Reyes Station. At that shop, they sell not only their own cheeses, but also an array of other artisanal and farmstead cheeses, such as Humboldt Fog and Wabash Cannonball. While the words artisanal and farmstead are starting to lose their cache in the United States (in part because they are not government regulated, so just about anyone can slap those two words on their packages), the words do have a specific meaning especially with European cheeses: as Conley and Smith explain in their introduction, artisanal describes cheese made in small batches with local milk; farmstead means that the cheese is made on the same property where the animals are milked. Both argue that the artisanal and sometimes the farmstead are essential in good cheese making. I have been reading Dan Barber’s The Third Plate and Andrew Beahrs' Twain's Feast. Both of these books are interested in the effects of modern industrialization on food, especially post World War II, when food became a convenient commodity rather than a localized and sustainable foundation to a community. Both authors talk about what happens when we lose connection to the sources of our food. For Beahrs, it often means the complete wiping out of a viable food source (such as the prairie chicken). Moreover, Barber argues for a new way of eating—one that is not of handpicked, rarefied produce but the vast array of localized ingredients that support each other (a sentiment I have been taking to heart when kohlrabi and turnips show up in my CSA box. I don’t particularly want either of them; however, I know that their growth adds to the health and sustainability of a local and organic farm I support. Thus, I eat kohlrabi and turnips). Indeed, the mantra “cook using the best local ingredients you can find” has become rallying cry of our modern food movement. Certainly, Barber and Beahrs and the women of Cowgirl Creamery all agree. The cowgirls of the creamery have an impressive lineage. Peggy Smith is a Chez Panisse alumna, and Sue Conley is a cofounder of Bette’s Diner, a fabulous retro-diner on Fourth Street in Berkeley that uses the best bread, sources local produce, and whips everything up from scratch (including pies and scones!). Through a series of relationships and connections that both Smith and Conley highlight in their introduction, they bought a barn in Point Reyes Station, and after a grueling three-year process, they opened up shop in 1997. They make their Red Hawk cheese on premises in Point Reyes Station (because the air there contains wild B. linens, a bacterium that creates the distinct taste of that cheese), whereas their other cheeses are made in facilities in Petaluma. Nowadays, they also boast a shop in the Ferry Building in San Francisco. During our tasting, led by a woman whose knowledge of cheese was astounding as she meandered from topic to topic, we ate crème fraîche, fromage blanc, a seasonal wildflower cheese Pierce Pt, the wildly popular Mount Tam, the hard to describe Red Hawk with its nutty chewiness, and ended with a dry aged cheese. Our guide instructed us to smell the cheese, to taste it with jam (and also without); she showed us the effects of cutting the cheeses into large curd and small curd; she explained blooming rinds and the difference between crème fraîche and sour cream; she directed us to watch the curds be separated from the whey as a troupe of cheesemakers worked on the next batch of Red Hawk. More than anything, our guide (who called herself a cheese educator) spoke about relationships, from Cathy Strange (the global cheese buyer at Whole Foods) to Ellen Straus (of the remarkable Straus Family Creamery which I crow about over and over and over again). She argued that cheese is the product not of Conley and Smith, but of a whole community of individuals who have come together to produce some of the best cheese not only on the West Coast or even in America; indeed, these are cheeses that have been celebrated in France. However, they take a community to produce. After our tasting, we purchased on-site sandwiches (my ham sandwich was layered with Mount Tam while the husband’s vegetarian option was slathered with Fromage Blanc) that we carried off to eat in a nearby park with picnic tables. The sun was hot, much hotter than we anticipated that Friday, and we both ate our sandwiches entirely, almost licking our fingers as we finished. Afterwards, we wandered around town (and I even found our next book club book in the used section of the bookstore). What a lovely Friday; if you’re in the area, I highly recommend the tasting and then the requisite sandwiches afterwards. You won’t be sorry. Another thing I promise you won’t be sorry about is this fancy macaroni and cheese. While you don’t need to have Cowgirl Creamery cheese, you should get the best crème fraîche and dry cheese you can find. The pasta itself is absolutely delightful. I know, I know, it's fancied up macaroni and cheese; however, this is the macaroni and cheese you serve to company. 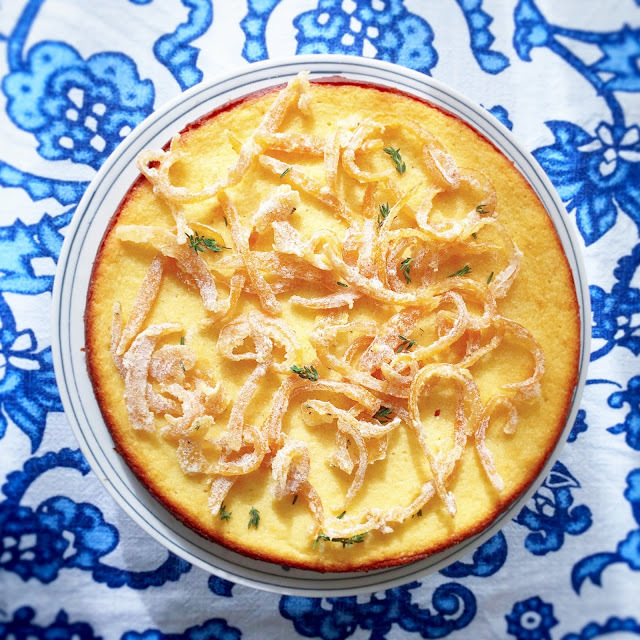 Conley and Smith argue that this dish is reminiscent of a light lasagna. I argue it’s just good pasta: the crispy ends of the noodles (produced after a quick spin under the broiler), the addition of green garlic and fresh herbs, and the creamy cheese (secret: cottage cheese whirled in the blender then added to the dry-aged cheese) elevate this simple and homey dish to one that you have to savor. If you are not anywhere near Cowgirl Creamery, I still recommend this cookbook. Substitute your own locally produced cheese or get to know your local cheese shop, who will have all kinds of international and domestic substitutions. And then you can make some of the best mac and cheese around. 2. While the water heats, puree the cottage cheese in a blender on high speed until smooth, about 1 minute. Pour in the crème fraîche and milk and blend until just combined. Set the mixture aside. 3. When the water boils, add the penne. Don't overcook it; drain the paste when it is just al dente. Spoon the cooked pasta into a 14-inch round baking dish or a 13x9 inch rectangular baking dish, and toss with the butter. Set the pan of pasta aside. 4. Pour the chopped tomatoes into a strainer and set aside to drain. Reserve the juice for another recipe or dish. 5. Heat a medium saucepan over medium-high heat. When the pan is hot, add the olive oil. Add the spring onions and green garlic and cook just until translucent, about 2 minutes. Add the drained tomatoes and cook until the tomatoes are soft and there is not much juice in the pan, about 8 minutes. Add the red pepper flakes, parsley, chives, and salt; stir and then transfer the tomato-herb mixture into the pan with the buttered pasta. 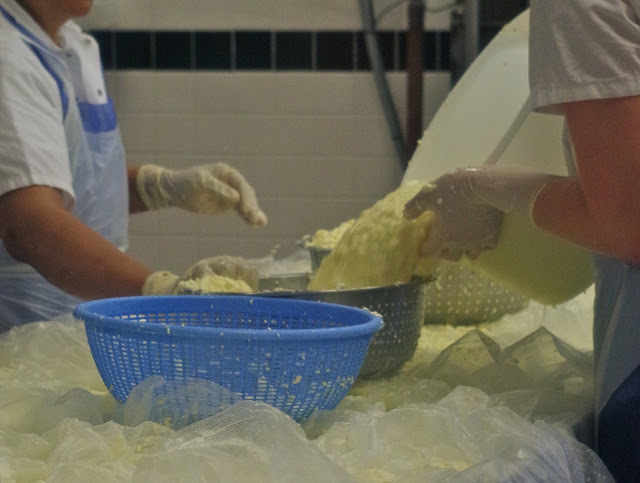 Stir the grated cheese into the cottage cheese-milk mixture, then pour intot he pan and stir again. Stir in half of the grated cheese and pat the pasta smooth with the back of a spoon. Sprinkle the remaining cheese over the top and bake for about 40 minutes; when the pasta is done, put under the broiler for 1-2 minutes until the top is browned and crisp and bubbly. Let cool for 10-15 minutes before serving.